They say opinions are like arseholes. Everyone’s got one. It’s easy to feel confused about what you should be focusing on in your business because everyone has a different opinion. It can feel like the advice is pulling you in hundreds of different directions & you don’t know which one to choose. Asking for feedback can often feel like the answer. Twenty brains are better than one, right? Feedback is a delicate business. It can be brilliant & enlightening. Or it can be misguided & disheartening. When you feel your confidence wavering because of something someone else said as “feedback,” it’s usually not a sign that person was right. It’s a sign that you asked for feedback from the wrong person, at the wrong time. To get feedback that lifts you up & steers you in the right direction, you’ve got to go about it in the right way. This post gives you my 3 DO’s + 5 DON’Ts for asking for feedback. I hope they steer you towards people that will give you excellent advice. 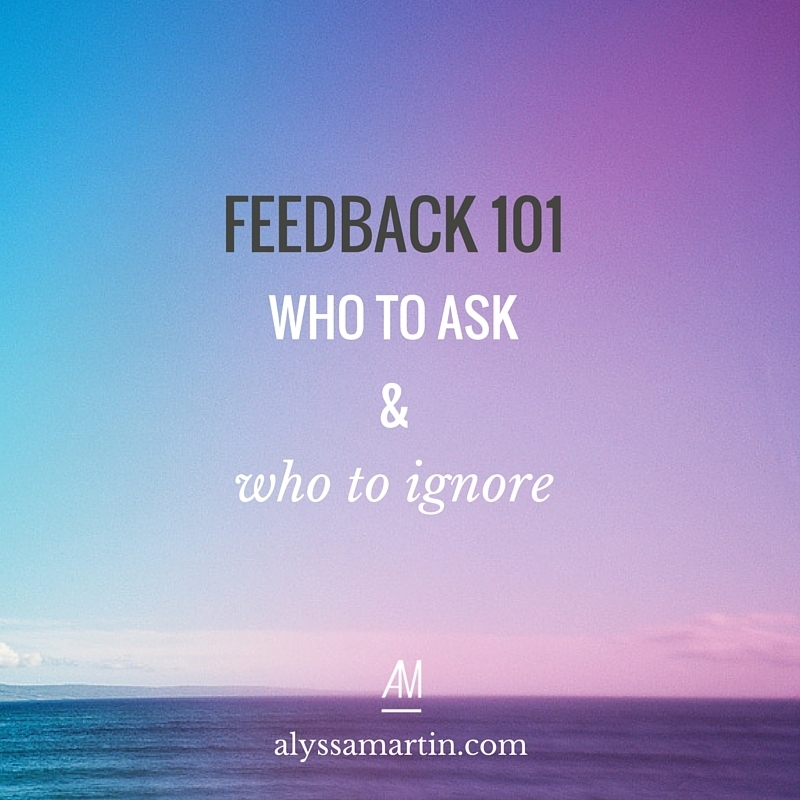 To be able to give you good feedback, we need to know what you’re trying to achieve. Without that, all the feedback you get is just going to be random. And when you get a wide range of conflicting feedback, it brings confusion, not clarity. Always get specific about what you want feedback on. Hi guys. I’m starting a podcast & I’d love to get your feedback on the name: Confessions of a Female Entrepreneur. 2 – I want the interviews to be like eavesdropping on a conversation between 2 business BFFs. I hope the “confessions” part of the title reflects that it’ll cover new territory & reveal a few unexpected secrets. What do you think? Is it intriguing enough to click on? The advice I got was so helpful because they knew exactly the kind of result I was trying to achieve with this name. It couldn’t have been absolutely anything that came back in the feedback, which would’ve left me more confused than when I started. 2. Keep your feedback circle narrow. You want to work with a very, very small percentage of the population, so most people’s advice won’t apply to you. you need to cast a wider net if you want to make good money. If you want to run a heart-centered business, don’t get advice from KPMG. They’re the antithesis of that. If you want to work with extremely feminine businesses in a new, feminine business model, don’t ask advice from macho, corporate men. And that’s not to say that any of those people don’t know what they’re talking about. They do. They’re smart & successful for a reason. But just because someone has had success, doesn’t mean their advice is right for you. Build a tight circle of people whose advice you trust & be cautious about getting advice outside that circle. Even the best advisors don’t know you as well as you know yourself. Sometimes, they can give you well-meaning, but not-quite-right advice. Maybe it’s just because you weren’t clear on your goals yet? Maybe it’s because you didn’t communicate what you wanted well enough? Maybe it’s because you both have a different definition of success? Maybe it’s because they have a different business philosophy to you? Trusting your gut & opening the doors to that conversation gets you closer to the advice that IS right for you. It’s a process. It won’t always happen perfectly the first time, so trust your gut when it’s telling you that something is off. Are there specific areas that you’re worried about? There’s no way all 8,000 of those people in that group are going to know you well enough to give you good advice. Nor are they ALL going to be your target market. You’re setting yourself up for a fall by blindly asking for feedback on Facebook without considering the kind of person that might respond. Let’s imagine that you’re asking a group of 8,000 people for feedback about your new web copy. Some people will tell you they love it. Some people will tell you it doesn’t resonate with them. And some people will tell you that you’ve missed the mark completely. But who do you listen to? To know who you should listen to, you’d need to click through to each person’s website & figure out if they’re the kind of person you want to appeal to. Otherwise, you’re taking advice from the kind of clients that you want to repel with your web copy – and that doesn’t make any sense. It doesn’t mean you can’t ask for advice on Facebook. It does mean that you need to think about who is in the group, are they the right audience, do they know enough about my work / industry? Be selective when asking for feedback. It’ll prevent you from getting a confusingly broad range of feedback that keeps you going around in circles. Someone I know is a web developer who works in a really traditional environment. He certainly doesn’t work with small businesses or solopreneurs, like us. But one night, he was giving me loads of advice on “how to make my website better,” which pretty much involved a total overhaul of everything. That simple statement reminded me that he was trying to get me to look like & appeal to a completely different market. I want to appeal to real people. He had the wrong background, experience, training to help me do that, so I had to ignore his advice & stick to my guns. Does this person “get” what I’m trying to achieve? Yes → Great, thanks for that helpful feedback. No → Then, your feedback doesn’t count. Would I actually want to work with you? That person at KPMG had no idea what he was talking about when he said, “you need to cast a wider net if you want to make good money.” Totally crap advice. There are entire books dedicated to the fact that you need to be different & not try to appeal to everyone. He’s basing that advice on other businesses that try to be a one-stop-shop & service big business. It has definitely worked for those kind of businesses in the past. But if you don’t want to serve big businesses & you want to serve solopreneurs in a hands-on, intimate way… then that advice is way off base. So make sure you don’t take advice from people who don’t understand your industry enough. The corporate world moves so slowly that they haven’t caught up to all the awesome strategies & tactics that work for small, nimble businesses like ours. Are you a mentor with a business that I admire?